Along with questionable tactics during the election itself, Burma also reportedly heavily limited media access to the process. The government banned most foreign journalists from entering the country, and arrested reporters found entering illegally, such as Japanese journalist Toru Yamaji, who has since been released after questioning by military police. Only 25 journalists who work for foreign media and are already based in Burma were granted access, along with two Chinese reporters. Burma is home to some of the world’s most draconian media laws, and it ranked 174 out of 178 countries in the 2010 Press Freedom Index. We have also labeled Burma as an ‘Enemy of the Internet,’ [link is ours] a distinction it continues to deserve thanks to its actions during the elections. Out of the 2,150-plus political prisoners in Burma, around 15 are journalists, and the New York-based Committee to Protect Journalists last year branded Burma the worst country in which to be a blogger. Sources close to the ministry who asked to maintain anonymity have told The Irrawaddy that Internet access is normal at all government and military institutions serviced by MPT, but ‘access for businesses and Internet cafes’ is shut down to control the flow of information in and out of the country. In addition, two websites that provide independent coverage of Burma’s current affairs — The Democratic Voice of Burma and The Irrawaddy — were temporarily knocked offline. 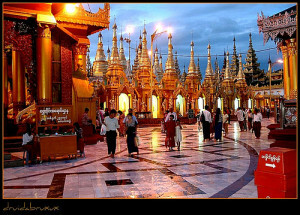 Le Coz writes, “The attacks [on these two websites] are believed to have originated from the Burmese government.” In spite of the alleged cyber attacks, Burma has a “lively cyber community of bloggers and Facebookers,” reports Phoebe Kennedy of The Independent. Aung says that the bloggers use anonymity software and proxy servers outside of Burma to get around government interference. The cyber attacks mentioned above are not the biggest threat to these CJs — prison is. Fellow blogger Nay Phone Latt is currently serving a 12-year sentence, for example, for reporting on the 2007 anti-government protest known as the “Saffron Revolution,” during which numerous peaceful protesters were killed. Image by druidabruxux (Javier Martin Espartosa), used under its Creative Commons license.